April 13, 2006 | LOGAN -- Frank Clark didn't tell fish stories. His big catch was a grizzly bear named Old Ephraim. Clark, a sheepherder with Ward Clark Co., became enthralled with hunting the beast, but for nearly a decade Old Eph eluded him. The creature, widely thought to be the last grizzly in the Bear River Mountains, was a mammoth -- 10 feet tall and more than a half ton, according to Clark. Clark claims to have killed Old Eph in August 1923 somewhere in the "right hand fork of Logan Canyon." He burned and buried the carcass, and a group of Boy Scouts later retrieved the skull and sold it to the Smithsonian Institution in Washington, D.C. Today, the skull is on display in the Tanner Reading Room of Utah State University's library. Reduced to a skull, Old Eph is still the stuff of legend. In fact, the lore surrounding the grizzly may have fuzzed some of the facts. How big was the beast? Was it really the last grizzly in Northern Utah? Is the skull cared for by USU's Special Collections and Archives really Old Eph's? The facts are beside the point, says USU archivist Bob Parson. "He (Clark) may have extrapolated from many bear hunting stories. He was a consummate storyteller," Parson said. "These bear stories get better with age -- they're like cheese or wine. But the Old Ephraim legend is important. I don't think it's nearly as important to disprove that legend." That sentiment is shared by many who know the tale of Clark and Ephraim. Larry Cantwell for years played the part of Clark during reenactments of the famed hunting expedition at Cache Valley's Festival of the American West, and he shared Parson's notion as long as a decade ago. "The facts are secondary," Cantwell told the Cache Citizen, a weekly newspaper, in 1985. "Frank Clark actually said (he killed the grizzly). If he was lying through his teeth, it wouldn't matter. People have accepted the story for years." Fact, fiction or perhaps some of both, the legend of Old Ephraim still lives. Clark had an affinity for animals, but he loathed bears. In a 1923 letter to William Peterson, then the director of USU's Agricultural Experiment Station, Clark wrote, "Do you know how a bear kills his prey, or rather devours it alive? ÝIf he is (hungry) he kills the first one by devouring it alive, if not so hungry he eats what he wants and lets it go to a lingering death." As a sheep herder, Clark was especially bothered by the havoc bears wreaked on local herds. In 1911, Clark's first year herding sheep, he charged bears with the deaths of 154 sheep. Clark became obsessed with hunting bears. Parson estimates that Clark killed roughly 40 of the animals between 1914 and 1943. Clark was born in Malad, Idaho, in 1879. He died in 1960, 37 years after he claims to have bagged Old Eph, and was buried in Lot 5 of the Malad Cemetary. Old Eph was already legendary by the time Clark became fixated on his demise. Trappers and hunters spread the tale of the 10-foot, half-ton killer that roamed Logan's canyons. Orsen Ryan, who moved to Logan in 1921, said in a 1950 radio interview with KVNU's Reed Bullen that President Theodore Roosevelt heard about Old Eph while hunting near the Snake River in Idaho. An avid hunter, Roosevelt decided not to pursue the beast because "he made up his mind that there was no such animal." A bear that massive was merely the stuff of imagination, he thought. The president was probably right. The Smithsonian determined the skull did belong to a grizzly, but Barrie Gilbert, senior scientist for USU's forest, range and wildlife sciences department, says it was not as large as Clark believed. "It was fairly monstrous," Gilbert said. "Compared to Yukon bears, the skull was bigger. But there's no way it was 1,100 pounds. Some bears that weigh that much have about 300 pounds of fat and eat hundreds of salmon. Some bears in (local mountain ranges) are starving." Gilbert examined the skull purported to be Old Eph's. He said it was more than 15 inches long and more than 8 inches wide. "Based on skull measurements, Old Eph was not one of the world's 12 largest grizzlies," Gilbert said. A larger skull was found in Yellowstone, he said, and that animal weighed about 550 pounds. Gilbert called that grizzly "a big bear." It's possible that the bear looked 10 feet tall on its hind legs, Gilbert said, but a more realistic weight was 550 pounds. The bear's age was estimated the same way scientists date trees. One of the fangs was sliced, and the rings were counted. The test showed the bear to be less than 10 years old, but Gilbert suggested otherwise. "There is often inaccuracy with counting rings," he said. "My guess is [the bear was] older than that." Clark grew to like the taste of bear meat. "It is good meat if you don't see it before it's skinned," Clark said in a written account of his hunt in 1923. But it wasn't his palate that drove him to hunt Old Eph. It was obsession. George Hill, a former professor at the University of Utah and son of the scout leader who found the skull, said Clark's fixation on eradicating bears drove him to "a fierce psychosis." Indeed, Clark said, "I have sworn eternal vengeance on bears and it shall be mine." By 1923, Clark had become familiar with Old Eph's migration habits. The beast was easy to track because of a deformed paw -- three toes. Clark had taken shots at and laid traps for Old Eph before, but to no avail. If it was the last grizzly, then it certainly made Clark's extermination efforts difficult. According to his written account, Clark laid a trap near his camp, about 20 miles up canyon from Logan, on Aug. 21, 1923. That evening, Clark's slumber was interrupted by "a roar and groan near camp." Old Eph had his paw caught in the steel jaws of the 23-pound trap. Clark thought the growling and bellowing came from his dog. He checked. She was silent. It couldn't have come from another trapper or hunter. The nearest person was three miles away, Clark thought. Clark tried to go back to sleep, but the noise was too much. He got up and slipped on his shoes, but not his pants. He took his gun, a 25-35 cal. carbine, and seven ball cartridges and started down the trail. "It was darker than hell and plenty cold," Clark said in his account. Perhaps the dark explains why he thought he'd caught a horse in his trap. Clark was overjoyed, yet anxious, when he saw Old Eph standing there, the chain from the trap wrapped around his paw. Clark's amusement quickly morphed into fear when the bear began to charge him. Standing atop a 4-foot bank, Clark was able to unload six of his seven rounds into the beast. Old Eph was spouting blood from his nose with every breath, but still would not die. "I gave him the last bullet in the brain," Clark said of the shot that felled Old Eph. "I think I felt sorry I had to do it." It was not the joyful feeling he expected to accompany his nine-year crusade, now complete. In fact, Clark told the Deseret News in 1959 that he wished he had not killed the bear. "Was I happy? No, and if I had it to do over, I wouldn't do it," Clark told reporter Chris Nielsen. Clark skinned Old Eph and then burned and buried the body. He marked the bear's grave with stones. As an epitaph for Old Eph, Clark "told the story to hundreds of scouts at the grave." Led by George R. Hill, a scout troop later went to where the beast's remains were believed to be. They dug up the skull, which was partially burned, and sold it to the Smithsonian for $25. 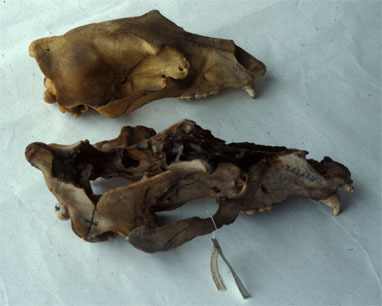 Grizzlies were widely believed to be extinct in the continental U.S. at the time, so the Smithsonian was excited to confirm that this was indeed a grizzly's skull. "The Smithsonian didn't care whose skull it was," Parson said. "They wanted to confirm it was a grizzly." That fact was confirmed. It's one of the few facts about the skull that has been substantiated. Sen. Orrin Hatch helped bring the skull back to Utah in the 1970s, where USU kept it on loan from the Smithsonian. Today, the skull still belongs to the Smithsonian, but is on permanent loan to the university. Old Ephraim got its name from a P.T. Barnum story about a bear that terrorizes a California community. Clark said he believed the bear was 10 feet tall because he once saw it bite a branch off an aspen tree that was 9 feet, 11 inches off the ground. "Now these are facts and not fiction," Clark contended. The skull did belong to a grizzly; the Smithsonian confirmed that. Whether it was the famed Old Eph is uncertain, although Parson believes Clark's story holds up. "As far as we can tell, it's the last grizzly ever evident this far into the Wasatch mountain range," Parson said. "There might have still been grizzlies, there may still be grizzly bears. To my knowledge, there's never been another one since [Old Eph's] death." After Clark's infamous encounter with the beast, news of Old Eph's demise, and the outlandish circumstances surrounding his death, spread. Even some during Clark's time believed the story became distorted as it was passed through the rumor mill. In a letter to Clark dated Feb. 12, 1953, Cache National Forest Ranger Owen M. De Spain said he'd heard people sharing versions of Clark's story that had "no resemblance of the facts." "It is disgusting to me," De Spain said of the gossip. "For this reason we would like you permission to have your story printed in the Logan paper just as you have written it." On Feb. 16, 1953, Clark responded to the request and OK'd the printing. His story appeared in the Feb. 24, 1953, edition of the Herald Journal under the headline, "Thots and Things: Here's the story of Old Ephraim by the man who bagged him." The legend grew from there and now is part of Cache Valley lore. Clark's story may be completely accurate, a blurred account from an obsessed man or just a "big fish" story that keeps growing. Whatever the case, the legend of Old Ephraim has its rightful place in local legend, Parson said. "When it comes right down to it, it's not important whether every single solitary aspect of the story is true. I don't think there's ever been a bear story told that's completely accurate," he said. "The most important thing is that it's a viable legend. It's a good story."